The boat neck style is a very popular neckline style. Here we have two dress styles, the basic boat neck dress that you can add trim and accessories to jazz up. We also have the draped style with drapes or lines going to the left shoulder. This patterns has 2 pattern styles. 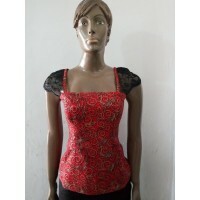 The cap sleeve bustier is a favorite for blouses. It is a must..